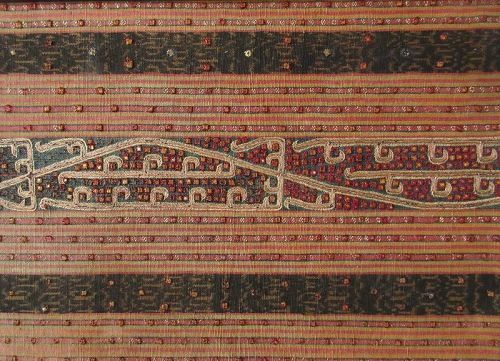 A framed Indonesian tapis, a woman's ceremonial skirt hand-woven with striped and scrolling motifs. Warp ikat, supplementary weft weave, and embroidery with silk thread, gold thread, and mica chip composition. Dimensions: 48" x 47 1/2"
Japanese export carving of a chinoiserie candle holder attendant, mounted on a gilt bronze French ormolu base. 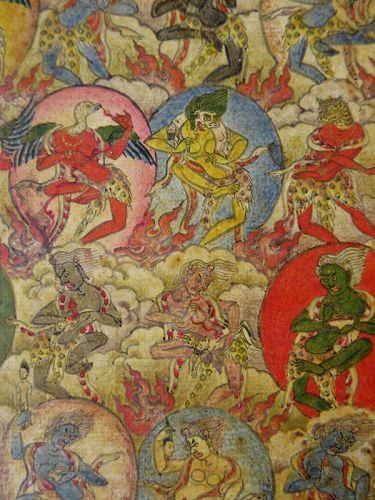 The heavenly attendant has original polychrome pigments of red, green, brown and beige and holds a long staff connected to the brass candleholder. 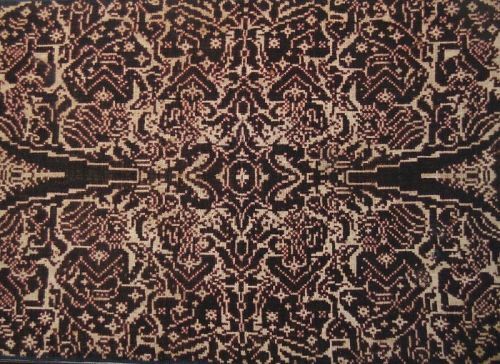 Double ikat, hand-spun cotton with natural dyes, with Wayang keno kneeling figures in rust brown. 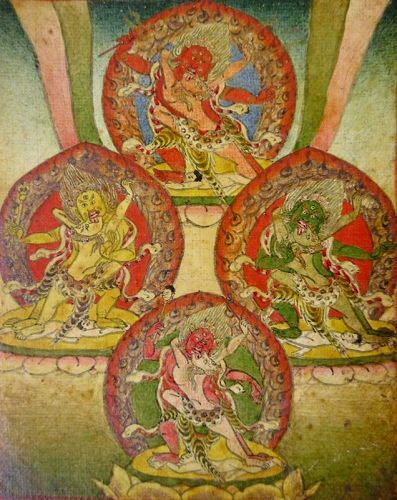 Wayang Keno are the triad of three Hindu gods Brahma, Vishnu, and Shiva. 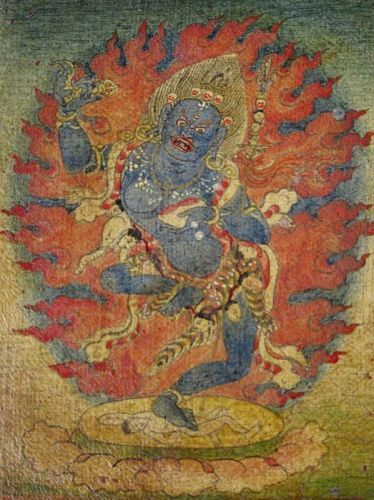 The textile is believed to possess healing properties as the name means "no disease". (Gering = disease, sing = no). From the Tenganan Pegringsingan village in East Bali. With wear consistent with the age. Dimensions: 21 1/2" x 77"
Antique Sino-Tibetan repousse hanging censer with iron chain. 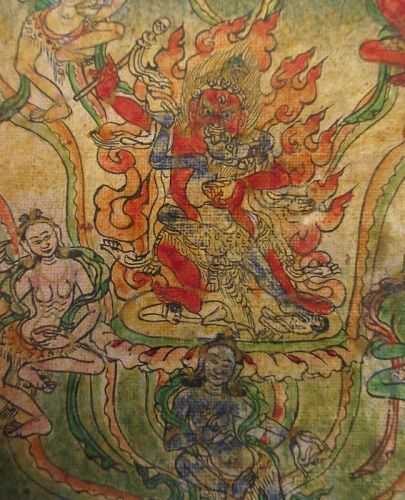 The hexagonal shaped body has the repeating image of a coiling serpentine dragon with lingzhi clouds of smoke, with inlaid turquoise on each side and touches of gold gilt. The base of the censer with a pomegranate form finial, the top of the censer with a finial in the shape of a fierce deity's head. 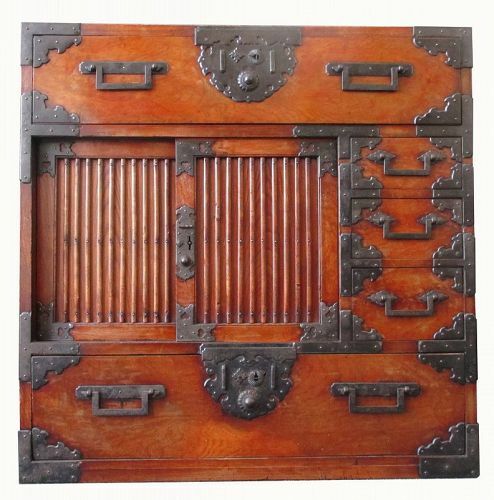 Japanese solid Keyaki isho tansu from the Sendai region. With original deep red lacquer finish. The interior of the drawers done in black lacquer. 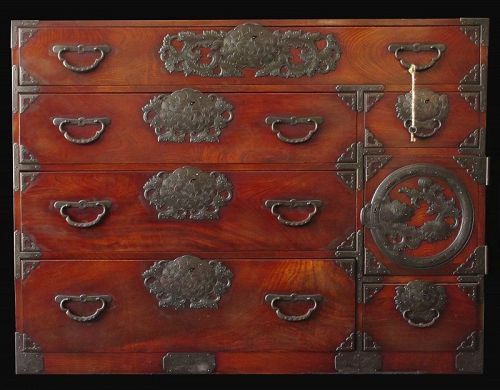 With black iron hardware incised with floral motifs, large lock plates with chrysanthemums and open work scrolling leaves, the small corner safe door adorned with a round open work iron plate with peonies and scrolling leaves, opening to two small interior drawers for precious keepsakes.